From preschool through our private elementary school, our students benefit from a completely unique combination of advanced curriculum, accelerated learning, and creative social and play experiences. As you research options for your child’s preschool through elementary education, you will likely discover numerous philosophies ranging from traditional to Montessori to play-based learning programs. 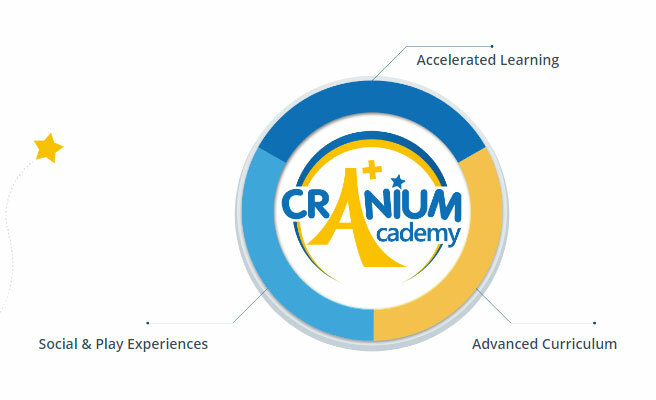 Cranium Academy was designed to revolutionize education, molding the best aspects of each philosophy into one innovative preschool and private elementary school experience with a completely unique approach to learning. Our exclusive curriculum soars beyond ABC’s and 123’s into active critical thinking. We believe every child should be exposed to a wide range of gifted level activities and concepts to be challenged and inspired to reach his or her true learning potential. True learning involves active critical thinking. We believe that children should be taught in a way that allows them to take what they learn and apply it to real-world situations. Our teachers and our exclusive curriculum focus on moving beyond ‘what,’ into ‘how’ and ‘why.’ Curriculum is designed to liberate learning beyond memorization to a higher goal of active critical thinking. At Cranium Academy, we believe parents, teachers and students must be engaged and actively involved to help children succeed. Along with ongoing communication, assessment results, and teacher conferences, our parents have access to a homework web site, loaded regularly with fun activities that complement what your child is working on in class. As a team, we can work together to help your child reach his or her true learning potential. Traditional curriculum is centered around teaching all kids in a class the same skills, leaving some students bored and others feeling left behind. We assess our students regularly and use results to design custom learning paths for each child. This helps every child reach their individual learning potential. Our teachers skillfully combine cutting-edge technology with hands-on discovery and exploration. We put the latest technology in your child’s fingertips, preparing them for success in the 21st century. From state-of-the-art smartboards, to laptops and ipads, our teachers balance technology-based learning with hands-on, multi-sensory play and discovery. They say it’s not work when you love what you do. The importance of balancing ‘work’ and ‘play’ begins in early childhood. At Cranium Academy, we believe that learning can and should be fun, involving both structure AND exploration, teacher guidance AND child discovery, laughter AND accelerated academics. Learning is cleverly disguised as fun, and children can’t wait to come learn, discover, and grow!